"Starting out as an industrial Designer, Tani Kunitake has worked on over 30 feature films. Tani has worked with famed directors such as Ridley Scott, George Miller, Terry Gilliam, David Fincher, Bryan Singer, Francis Lawrence and Alex Proyas to name a few. He has contributed to the visual worlds of Blade, The Matrix, Fear And Loathing In Las Vegas, Fight Club, I Am Legend, Serenity, The Avengers and Man Of Steel. In addition to the live action films, Tani has also worked on a few animation features including his directorial role, Final Fantasy the Spirits Within and The Animatrix Final Flight Of The Osirus. Tani Kunitake continues to work in the field with his most recent credits including Terminator Genisys and Star Wars Episode 8. Dani Swan is an Australian born Actress, Voice over Artist, Motion Capture performer, Dancer, Producer and Creative Director based in Hollywood, CA. Dani Swan is the lead Actress and Motion Capture Performer for 'Cerulean' and the model behind the Comic Book which is in pre- production. Dani Swan was the Guest Judge and Creative Director for Caribbean's Next Top Model (Flow TV). Dani Swan left Australia and traveled the world performing and training since she was 18. It was her combination of her Acting/Voice Over, Diverse Movement background and Femme fatal looks that got the attention of her Hollywood team, VOX USA. Dani Swan is partner in Cyber Blue Productions and is on the board for Performance Motion Capture, SAG-AFTRA and is working in Film, TV, Gaming and Stage. 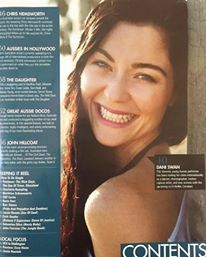 Most Recently Dani Swan was asked alongside the 'Cerulean' Team to be the face of the Australian Sci Fi film festival in October 19th- 22nd and was featured as the ' New Face' to watch in Film ink Magazine. 'Cerulean' is the face of the poster and media. Tani Kunitake and Dani Swan are flying in from Los Angeles to Sydney Australia to do a live panel. In front of a live audience, Tani will also be demonstrating a live drawing of Dani 'Cerulean' as it is done in the pre-production stages of film. Cerulean' appeared on The Tyra Banks owned TV show Caribbean's Next Top Model Season 2. The prize for the winner on Caribbeans Next Top model Season 2 was Being drawn as a character in the 'Cerulean' Graphic Novel/Comic book by Tani Kuntiake. This was shot and broadcast internationally. Dani Swan was the guest judge and Creative director/Mentor on her episodes.